Will Northern Rockies wolf delisting result in huge kill-off of wolves? 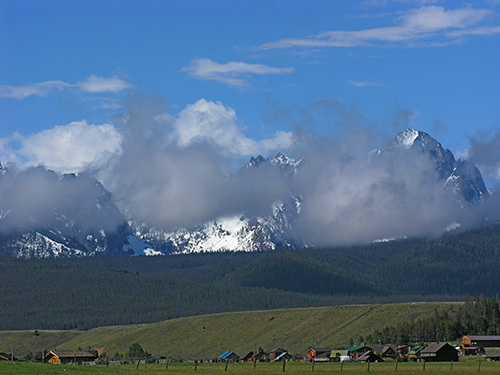 The Sawtooth Mountains at Stanley, Idaho. Photo by Ralph Maughan. June 2006. Will wolf delisting in the Northern Rockies allow the state of Idaho to wipe out all the wolves in the scenic area where the public can actually see them? Idaho has 650 or so wolves. The state’s vast backcountry and wildlife resources have allowed wolves to prolifterate more than in Wyoming and Montana. There is no good evidence these wolves have reduced Idaho’s elk herds, but the very modest recovery goal set by the Idaho wolf plan would allow the state to reduce the the wolf population to about a dozen packs, which would be from 60 to about 150 wolves. Idaho has done a good job managing wolves until now, but Idaho’s Fish and Game Comission and the state’s political leadership (which went backwards in time with the last election) doesn’t like wolves. 5 Responses to Will Northern Rockies wolf delisting result in huge kill-off of wolves? How many of you left-wing losers ever get more than 100 yards from a trail on the one weekend of your life that you visit the rockies? You don’t have a clue how many wolves exist in the areas, and if you think you do you are being blind to the facts presented by our biologists, instead playing on your bleeding hearts to “save the precious wolves, maybe I’ll see one if I ever get 10 feet from the suv”. Read the FWS fact sheets, idiots. Stan, Stan, Stan, don,t you even have the basic clue that the whole wolf supplementation in the westren United States was put in motion by President Reagan (there’s a left winger for ya) on October 7,1988. Google it. There is not a shred of evidence that Idaho’s elk population has been reduced by wolves. This follows with the science…Idaho fish and Game has been killing off the lions and black bears on the Lochsa river from 1999 to present….there has been no increase in elk whatsever, even though the wolves did not really appear in the scene in any numbers until 2003. The elk will start to increase on the Lochsa River when the habitat is better for them…..
Wrong, Rich. The Yellowstone herd that migrates into the Sand Creek area of Fremont county has seen a major downturn since wolf reintroduction – directly attributed to predators (this is also adjacent to the grizzly recovery area). I could cite other factual instances where the herds have decreased, but you would just want to argue with me. Read the facts. BTW, how does one “improve the habitat” of a wilderness area? Stan, Stan, Stan, “One” does not improve habitat in a wilderness area; it is improved, or not, by natural processes such as fire, regrowth, die offs, and other natural processes between all the naturally occuring interactions of flora and fauna. Prehaps some basic biology classes are in order.